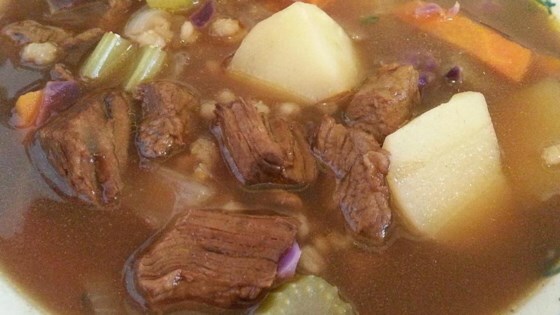 "This is what I consider the ultimate beef soup. Great on a frosty day. For beef stock, I use 2 1/2 quarts water and 6 teaspoons beef base. Also, use inexpensive red wine. No need for the good stuff here, and cheaper actually works better! Try with leftover pot roast." In a large pot over medium heat, combine the oil, onions, celery, carrots, and garlic. Saute for 5 minutes, or until tender. Add the beef stock, barley, bay leaf and thyme and simmer until barley is softened but not mushy. Add the wine, potatoes and beef. Add the browning and seasoning sauce now if you want your soup to have more of a brown color. Simmer another 15 minutes and add the cabbage. Allow to simmer another 15 minutes, or until all vegetables are tender. Salt and pepper to taste. A fantastic soup. I found that 3/4 c of barley made it very thick. I would cut it down next time to 1/2 to 2/3 c. The wine difinitely gives it a nice flavour. YUMMM! I left out the cabbage so that my daughter would eat it ! I did it in the crockpot for 4 hours on high and it was great.